The appliances in your home do some heavy jobs. When one breaks down, it throws a kink into everything. Your smoothly running home is suddenly without a major player. This is especially true when it is the refrigerator that malfunctions. Other appliances are a little easier to get by without them. If the washer or dryer goes out, then you can go to the laundromat. If your stove goes out, then you just cook in the microwave or on the grill. When your fridge goes out, it is a little harder to compensate for. That is why you need to quickly assess your options and make a choice on a new refrigerator. There are many different refrigerators on the market, though, so we thought we would help. We went ahead and did a full review of the FGHB2866PF from Frigidaire. We’ve included some background information, specifications and pricing info. We also did a little comparison shopping and sifted through reviews for pros and cons. You should have enough information to make an informed buying decision. Frigidaire has been in the fridge game for a long time. In fact, it was this company that developed the first self-contained refrigerator. The company has had some high-profile backers, too, such as the founder of General Motors, William C. Durant. When the company started using the name Frigidaire in 1919, it was well-known in the industry for quality products. It is actually from the company's name that the slang term "fridge" originated. The company has changed ownership over the years, too. General Motors owned it, then Delco-Light. Later White Sewing Machine Company owned it, and today Electrolux owns it. Throughout the years and ownership changes, the basic idea of creating quality products that make life easier for homeowners has always rung true. The FGHB2866PF is just a modern example of the type of work Frigidaire does. Speaking of the FGHB2866PF, there are a couple of important things to point out before we jump into the review. First, this is a French door refrigerator, which means its compartments are split up with the fridge section on top. It opens with a set of French doors, hence the name. At the bottom is the freezer in a slide out drawer. This style of fridge became quite popular mostly because it is easier to organize and provides more room in both sections. In addition, it has a more stylish look. Another thing to note with the FGHB2866PF is that it is a discontinued model. Discontinuing a model is commonplace in this industry. New models come out, and older models have to move out to make way for them. A discontinued model may be harder to find when shopping, but they also are usually sold at steep discounts. You can generally save a lot if you shop around. However, the more time that goes by after the discontinuation, the harder it will be to find it. So, keep that in mind when shopping for the FGHB2866PF. The FGHB2866PF French door refrigerator offers 27.2 cubic feet of space. The fridge occupies 18.5 cubic feet, and the freezer is 8.7 cubic feet. This is a nice amount of room, but Frigidaire goes a step further by offering some nice features in each compartment. In the fridge, you will immediately notice that the lighting is not the old style that is very obtrusive and takes up space. You get streamlined, compact LED lighting. It is also much brighter than other lighting styles, which means you can easily see the entire fridge area. No more losing things way in the back. The fridge also comes with different kinds of shelves that all feature Spill Safe technology to help make messes stay in one spot and allow for easier cleanup. There are two half-width sliding shelves and a fixed, quarter-width Flip-Up shelf. In addition, you get a full-sized meat or deli drawer and a full-sized cool drawer. There are also two crispers and two humidity-controlled drawers. There is a lot of space in the doors, too. Here you will find a dairy compartment, a hanging can rack, two one-gallon adjustable bins and two fixed bins. The freezer is a drawer style, but a basket with a divider makes it easier to organize. Plus, no worries about not being able to see in this compartment because it also has that bright, modern LED lighting. You also have the option of a second icemaker. The main icemaker is in the dispenser on the fridge door, which allows you access to crushed or cubed ice. It also dispenses cold, filtered water. It is also lit with LED lighting so you can easily use it even for late-night trips for some water. As explained, the FGHB2866PF from Frigidaire is a discontinued model. The company is no longer making them. This basically means that you cannot buy it directly from the company anymore. 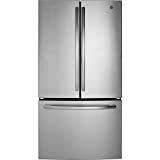 In addition, most major retailers that stock Frigidaire refrigerators will not have it in stock. You will need to look at outlet stores and other retailers that sell discontinued models. A good example is Sears Outlet. This store sells a few different options. It sells fridges that were floor models or that have some minor damage. They also sell refurbished models. These are used refrigerators that have been completely maintenanced to be like new. Currently, Sears Outlet is offering the FGHB2866PF for around $1,325 for any of these options mentioned. You can also look at smaller retailers, such as AHC Appliances, which is selling this model for $2,349, or Big Sandy Superstore, which has it priced at $1,499.99. As you can tell, shopping around will be important in finding the best price possible. Doing your homework on where to shop helps a lot, so you know which stores in your particular area sell discontinued appliances. You may want to do a search for discontinued refrigerators to see what comes up. Some stores may not have their inventory online because it can often change, so you may have to visit or call to see if they carry the FGHB2866PF. Do keep in mind that since this model is no longer in production, a store that has one could sell it fast, so you should move quickly when checking out where to buy. Comparison shopping is an important step when buying a product, especially one that costs quite a bit like a refrigerator. By comparing different options, you get to see what is good and bad about them. You can see how one measures up to the others. This can help you to know where you are best off spending your money. Often when comparison shopping, you will look at products in the same price range, but since the FGHB2866PF is discontinued and there is not a clear price, we decided to instead compare models with the same capacity. So, all of the models below are around 27 cubic feet. We provide you with some overall ratings and included dispenser information because that was the only feature that was really different between the models. The FGHB2866PF seems to suffer from a flawed icemaker. Too many reviewers had issues with the icemaker constantly breaking down and failing to operate properly. This dragged down the overall ratings for this model. However, people who did not seem to have icemaker issues really loved this fridge, saying it was easy to use because it had a lot of storage and good organization options. Furthermore, almost everyone said it looks stylish. This GE model gets pretty good reviews. Consumers like that there is plenty of space and that it is easy to organize. One thing that came up over and over is how quiet it is when the compressor is running. There were also comments about how this fridge keeps food fresher longer. The only real complaint was that this is a little pricey for being so basic without a lot of features. problems right after the warranty expires. The icemaker seems to be the culprit. It is not easy to work on or diagnose issues, so the chances are good if you buy this model, you won't have an icemaker for long. Beyond that, people did like the look of the fridge but felt the organization wasn't very good, making it difficult to find places to store taller or bigger items. Plus, the door bins are small, reducing storage there as well. On the plus side, the lighting is well-done, and the freezer is spacious. This is another model that has numerous issues. For this unit, it seems to be bad door seal design that leads to temperature control issues. Consumers did like that it is spacious and easy to organize. They also felt food stayed fresh longer than average. The seal issues may have occurred with a certain batch of this model, but since it is now discontinued, it is difficult to know if the one you find will have the seal issues. We do want to note that having to open both doors to access drawers in the fridge compartment is very common with a French door style fridge. However, enough people mentioned this that we felt it was worth including. It seems to be fairly clear that the reason for the discontinuation of the FGHB2866PF was the serious issues with the icemaker. Consumers could not be more vehement about this issue and how unhappy they were. Many had it serviced multiple times, only to have it keep breaking down until it was out of warranty. This is not a cheap fix. Estimates to fix the icemaker are around $500. So, this points to a very good reason why Frigidaire simply discontinued the model. This is also a good reason to wary about buying this model. We cannot recommend purchasing it for that reason. This is also why we gave it a 3/5 rating. What allowed the FGHB2866PF to get at least three stars was that many people found the icemaker issues were not that bad and that the good points of the model far outshined any problems. In addition, it does not seem that all the refrigerators made under this model number had icemaker issues, so there is a chance there may have been a change in the icemaker at some point in production. That is something to keep in mind if you do decide to buy the FGHB2866PF. This unit have good amount of storage space,easy to clean but have a faulty ice maker.